I don' t have a green thumb at all, so the plants around my apartment tend to need minimal care and attention. Obviously from the title of this post, you already know what plants fit this bill! I can totally see why it's a big trend right now in the home decor industry to have terrariums around the house. They're hearty and perfect for people who are inexperienced at taking care of plants but still want to add some greenery to their home. 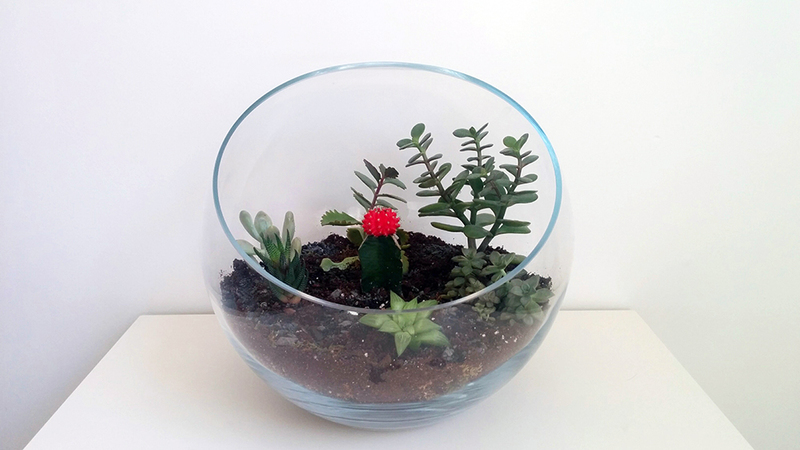 I recently repotted my succulents into new terrariums, so I thought I'd create a DIY post that anyone can follow in order to create a terrarium that pretty much sustains itself without too much attention from you. Succulents and cacti love well drained dry soil and are prone to root rot if the soil isn't drained well. A pebble base allows the water to drain down into the pebbles and not linger in the soil. Place around 1-3 inches worth of pebbles on the bottom of your glass container. You may want to put more pebbles on the bottom if your container is particularly large. At this point, you can also add a carbon layer in your terrarium on top of the pebble base. Carbon pellets are available at any pet market and they act as sort of a terrarium "air freshener" by removing decaying organic material. It keeps the terrarium smelling fresh. On top of the pebble base (or carbon base if you put any in), place a thick layer of Spanish or peat moss. The moss acts as a filter to allow the water to drain more easily, and it prevents all the soil from falling into the pebble base. Place around 1-2 inches of soil in top of the moss. You can use what you have on hand if you already have some soil around the house, but soil that drains well is best for succulents & cacti. Home Depot sells potting soil that is specifically for cacti and succulents. 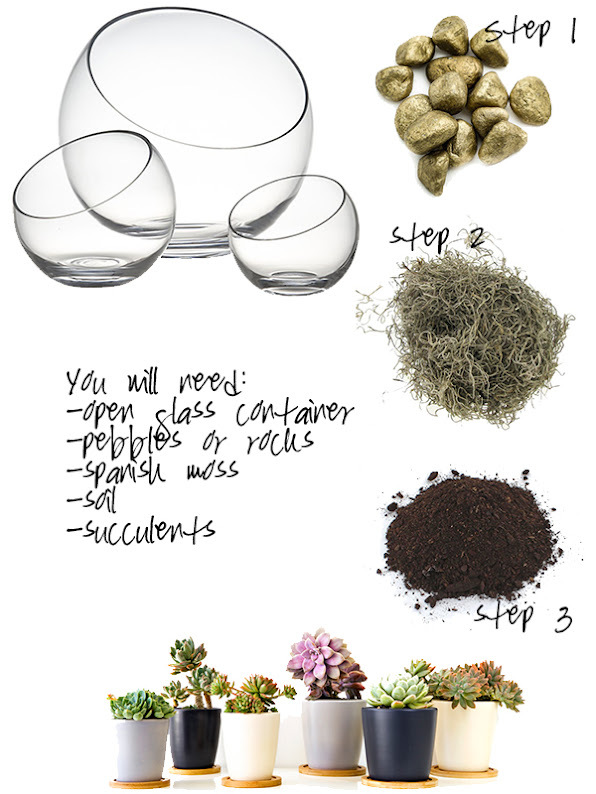 After planting your succulents, as a last step, you can place some more moss on top of the soil for decor and aesthetic value. Or, if you have any more rocks, you can also place them on top of the soil as well. The number one reason that succulents and cacti die is over-watering. These are dessert plants and they are naturally built on getting little water. A good rule of thumb is to water your terrariums once a week, but if you see the leaves starting to soften and shrivel, you can add a little more water (but not too much!) the next day. I water just enough to moisten the soil but not to the point where it's sopping wet. The soil should be almost dry if not completely dry during the week. Water less in the winter, and water more often in the spring and summer. Succulents go into a sort of hibernation in the winter due to the lack of sun. Prune your succulents if they have dead leaves or are getting too large for their terrarium. Other than being unsightly, dead leaves aren't good for the soil or the succulent itself. If you're pruning, I recommend taking a healthy looking leaf and consider propagating it in another pot. 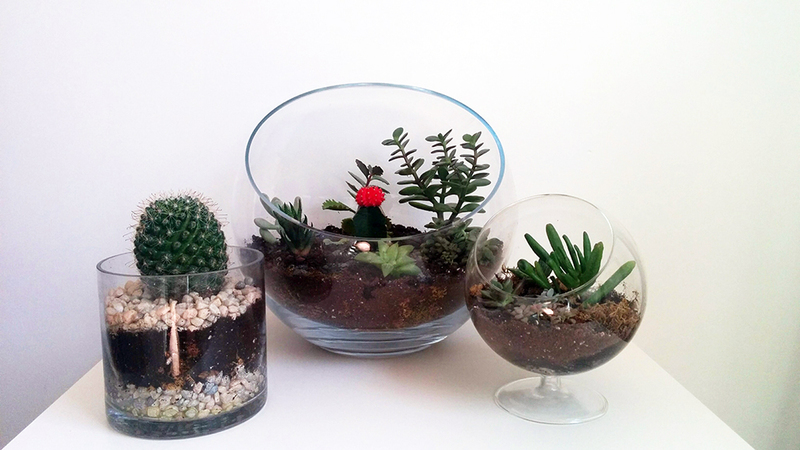 Don't choose a closed glass container or glass cloiches for succulents & cacti. Closed terrariums are for tropical moisture and humidity loving plants such as ferns and moss. Succulents and cacti need fresh open air and hate humidity. Yes, succulents and cacti still need sun! Although they're hearty and can go without sun for a good time, they still need sun like all plants. My cactus is fine in indirect sunlight, but my other terrariums thrive in sunlight.